Glass Beach: I'm a Find! I woke up the other day to a convo from the lovely Steph, letting me know that my Passport Wallet is an Etsy Find! 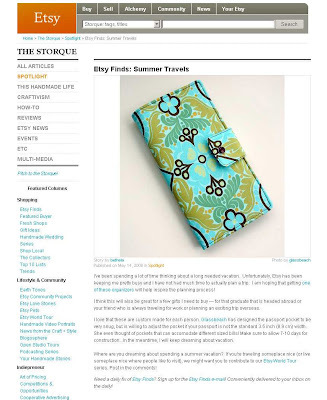 For the uninitiated, Etsy disperses news/how-to's/style commentary from its Storque site and often selects sellers to feature. I'm thrilled to get mentioned! It'll be the first time this year, so I'm expecting it to be like the jungle in "Romancing the Stone" sans a young Michael Douglas with a machete. Bummer. Yay, the weather folk are finally predicting sun! For the third time (but I love it just as much as they do). Hey, do you remember an old movie called "Napoleon and Samantha" with an itty-bitty Jodie Foster and my childhood heart-throb, Johnny Whittaker, and an old circus lion? I got it from the library the other day to show the kidlings and Michael Douglas played a poli-sci student (or "hippie") who saved the day. The movie was much more surreal than I remember. Hi and congrats on the etsy find! I have been reading your blog for awhile. I think this is my first time writing, though. I couldn't resist the "What are you doing?" question. I gave a Boston by Foot tour of Beacon Hill (www.bostonbyfoot.org) today and went into work :( but the piles were getting out of control. It's a beautiful day in Boston! I'm on my way to Quincy Market to enjoy my new favorite restaurant, Wawamama! I don't think any sewing is in the works, but I do need to organize my sewing space, so maybe I'll do that -- along with the laundry. Enjoy the rest of your weekend!! Hmmm. I should put all this on my blog!